I'm getting back into photography. A couple of weeks ago I processed a few images I shot at the beginning of 2014. It was fun and satisfying. Looking back I noticed I've hardly done any shooting the last six months. After a little encouragement I went out last night to do my first photography among the many windmills to the east of town. I've shot there before a few years go. Still, I knew my results would be different this time than anytime before. After all, I'm a few years older meaning the artist has changed a bit.. This image was made with my new 14-24mm F/2.8 AF-S. The lens is amazing. But, it also distorts unlike my perspective control lens, the 24mm f/3.5 PC. This image straight out of the camera was okay but all the windmills were tipping towards the center which is pretty indicative of most very wide lenses like this zoom. 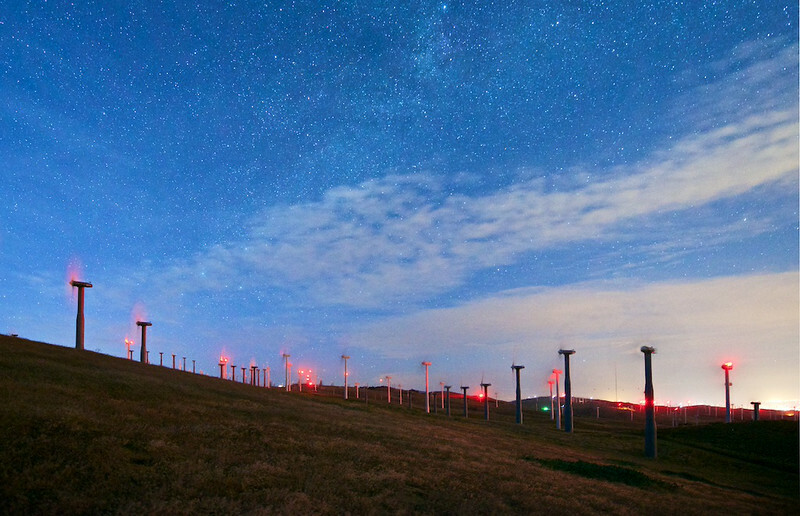 I was able to make a few modifications to the file so the windmills look more natural and the stars look like I thought they did. The clouds add a little drama to the whole scene without totally blocking the sky. The lights you see on the right is the town of Mojave. It looks like a huge metropolis in this night image. The colors were a bit of a challenge in that by this time most of the light on the windmills was coming from the red blinking aviation lights blinking at the top of some of these towers. This image is facing almost north. Polaris is off somewhere on the left portion of this image. No, I can't identify the North Star specific there are too many other stars competing. When you're out there, you don't see nearly this many stars. Clearly, there's something about the light capturing abilities of my camera that show so many.